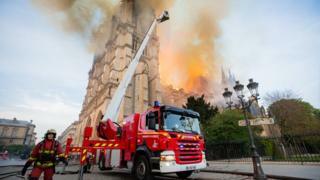 The main structure of Notre-Dame cathedral - including the two bell towers - has been saved after firefighters worked through the night to tackle the huge blaze. Guillermo Rein, professor of fire science at Imperial College London, told the BBC that "what the Paris firefighters did was close to a miracle". The cathedral's roof is a complex piece of carpentry with very thin and very thick columns which are all flammable, he explained. The thin parts ignite first and then ignite thicker wood which burns for a long time. He explained on Twitter: "Let's pause to remember how fires actually burn. You need oxygen, fuel, heat and a chemical chain reaction. Removing the fuel is a no go. Churches have no shortage of things to burn. "The heat that a fire this size is putting off is tremendous. Little options for interrupting that. The chemical chain is off to the races. That horse left the stable in the first five minutes. "That leaves the oxygen. Unfortunately, even if the roof had not burnt off, churches are nearly impossible to control ventilation in. Their design is to be open and airy. Great for Sunday worship, terrible for managing fire spread." Pompiers de Paris, the city's fire brigade, posted a video showing how they tackled the fire. "They would have to go inside the building or use aerial appliances, ladders and hydraulic platforms," he said. "But you're putting water on the outside of the building and the only way you sort it is if you attack it from the inside." Professor Rein said he wasn't the first person to come up with the suggestion, however it was "not a good idea because it would have damaged the structure of the cathedral, collapsing the walls". The force of water coming from an air tanker is strong and no-one has been trained to use one in a city. He added that Monday's fire was "not the time to test this". Professor Rein says that "fire engineering" will need to be considered when reconstructing the cathedral. Fire engineering is now in place in modern landmarks such as the Shard in London. He said: "The roof was not protected whatsoever." "We keep seeing these buildings go up in flames like this and it's relatively easy to prevent," he said. "In this building you've got invaluable artefacts and it's so easy to prevent and that's by installing sprinkler systems. People are still building without them and it keeps happening."